Are you looking for math apps for kids to complement your homeschooling curriculum for reading? Here’s a great one. Everyone wants to be on time, and you can’t be on time unless you can tell time! Give your children this great resource that will help them recognize the numbers on a clock and learn how to tell time on their own! Jungle Time is a great jungle-themed app to help your child learn how to tell time. Kids love the fun sound effects and animations, and these math apps are packed full of flexible levels and features. “There is absolutely no doubt about it – Jungle Time is absolutely THE most full-featured time telling app I’ve ever laid my hands on. It is also the telling time app that my children enjoy the most. If you’re teaching a foreign language you can also use this app to teach time in that language – 11 of the most popular choices are included: English, Spanish, French, Italian, German, Dutch, Russian, Japanese, Korean, simplified Chinese, traditional Chinese – all native speakers. My daughter takes the iPad off on her own and comes back with it to show me her progress, “Mom, look at how much I learned!” She’s 8, but has never managed to really truly cement her time telling skills although we’ve gone over the concepts many, many times. Jungle Time makes daily practice a lot more fun for BOTH of us, it sure beats black and white worksheets! Somehow that roaring, smiling, or trumpeting animal when a telling time question is answered correctly really makes this app fun for children. The jungle sound effects, the funny animal sounds and facial expression – they all make the (seemingly) endless practice that goes into learning to tell time on a traditional clock face that much easier. 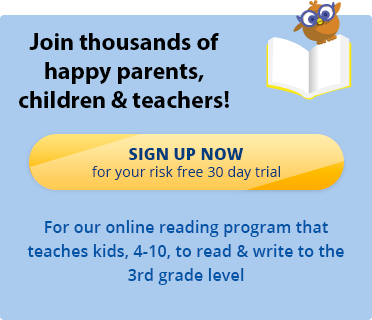 As everyone knows, math and reading go hand in hand, so if you’re interested in a great online reading program that can be used as a homeschooling curriculum, as a supplement to your existing curriculum, or as an interactive reading game for kids, sign up for a free trial of the Reading Kingdom.